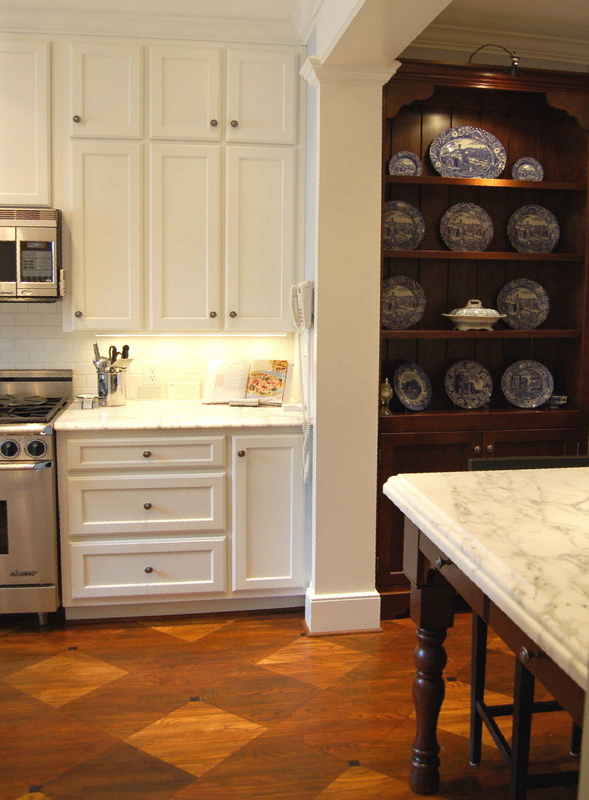 An old idea with a new twist was applied to the renovation of this vintage kitchen. The ceilings were only 8 feet high. The objective was to create a focal point that would draw the eye downward. 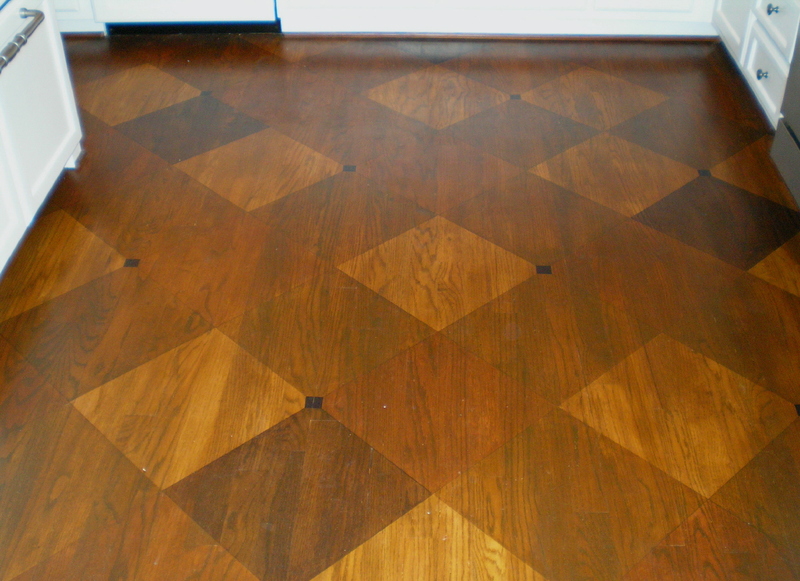 Over the years, new hardwood floors had been installed in the adjacent rooms. None of them were the same color but this is the point where they would all come together. The solution was to apply a classic design that would be interesting and visually compatible from all vantage points. Designs such as these are challenging since the pattern must be an appropriate scale for the space and also line up geometrically. Equipped with a measuring tape, knee pads and a calculator, one full day was spent making sure the layout was perfect. 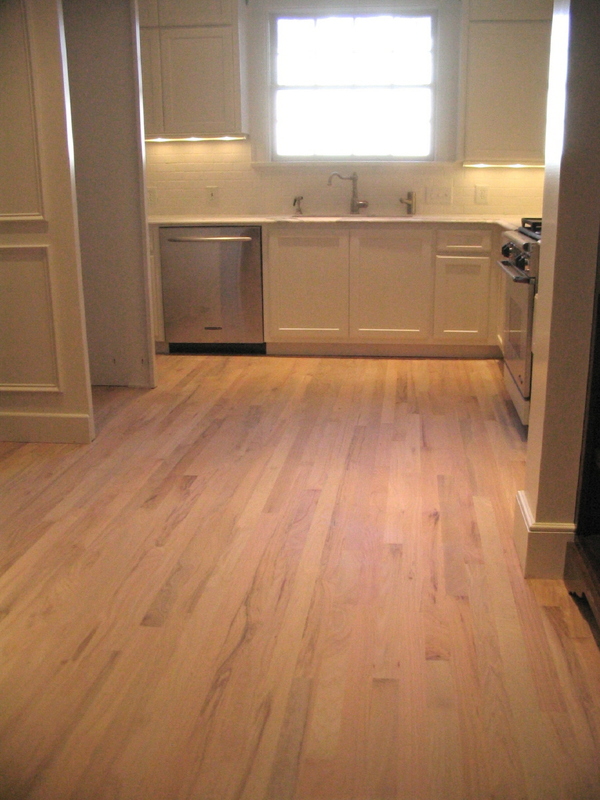 This floor began as raw wood. Five colors of stain were mixed to blend with the adjacent colors of wood flooring in the adjoining rooms. 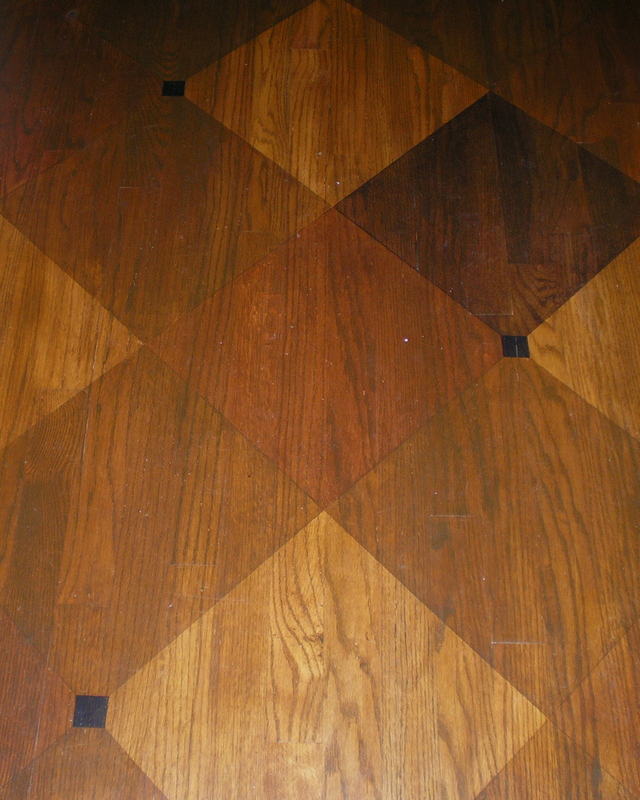 Specific techniques must be followed to keep the different stains from “bleeding” and make sure each line is crisp. During the process, no one was allowed on this floor without protective foot gear. Scratches or dirt would not be erasable! 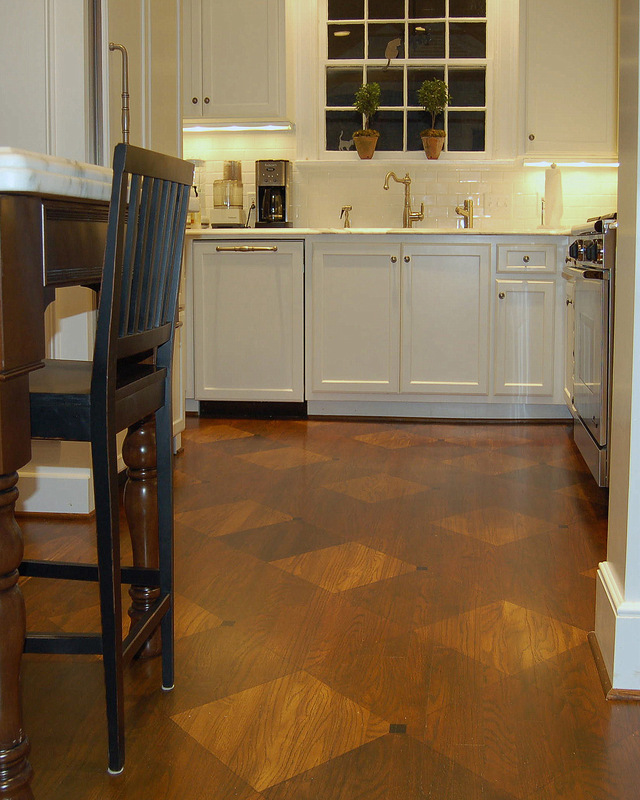 When the design was completed, the flooring specialists returned to apply 3 final layers of polyurethane. Since each color was carefully matched, only water based products were used to make sure the floor would not yellow over time. 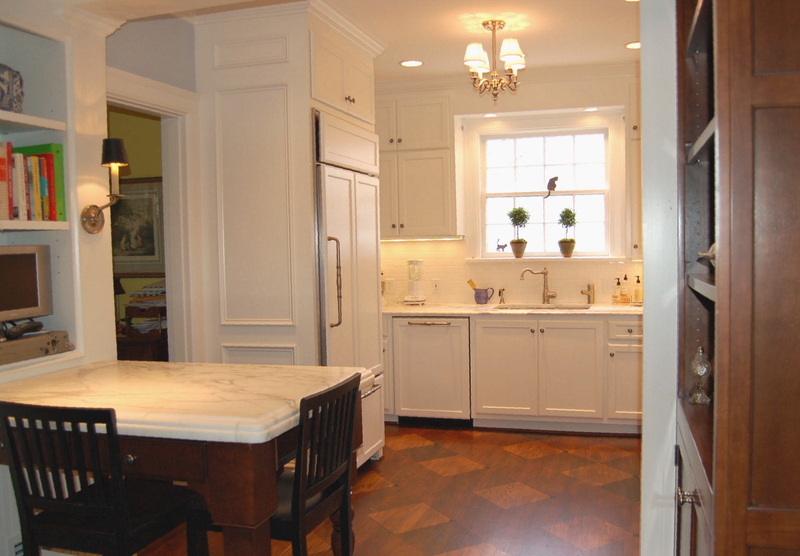 To see more from Atlanta decorative painter Kass Wilson, visit our faux finish projects.